Nope..this is not a political post. Instead this is all about the flu! 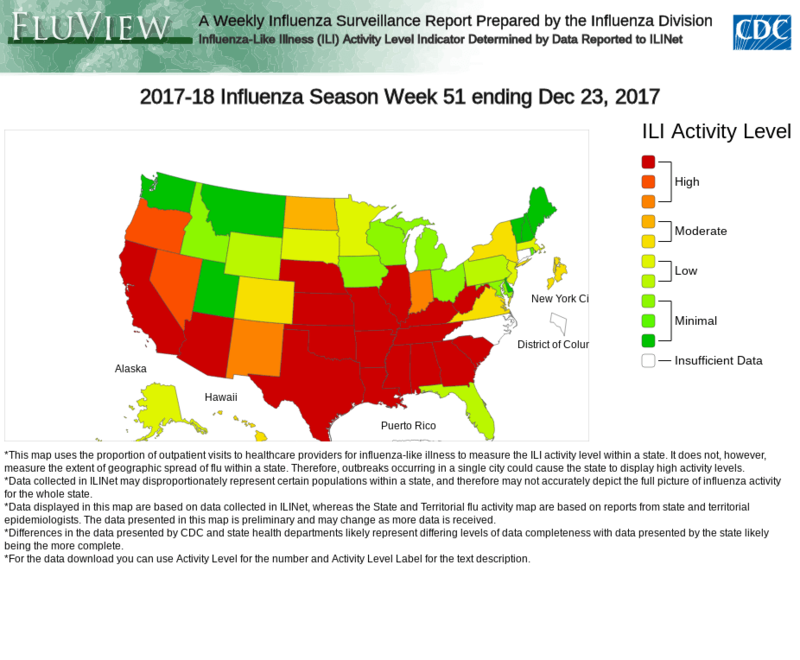 As you can see by the map below, much of the United States is quickly becoming red which indicates the highest level of flu activity. I can assure you that here in South Louisiana, my office has been inundated with kiddos with the flu over the past 2 weeks. So let’s talk about this year’s flu season so far. Flu is bad this year…there is no way around that! At this time the Center for Disease Control (CDC) reports that the most common circulating strain of the flu virus is an influenza A (H3N2) strain. There are also influenza A (H1N1) and some influenza B strains circulating as well, but just not as commonly as the H3N2 strain. So why is an H3N2 flu season a bad thing? Well, H3N2 viruses are more likely than their H1N1 and influenza B counterparts to make small changes to their structure that can allow them to evade the protection offered by the flu vaccine. The CDC estimates that in prior flu seasons, the flu vaccine has been 50-60% effective against H1N1 and influenza B strains while only about 30% effective against H3N2 strains. However, we will not know how effective the flu vaccine really is until much later in the flu season after more testing can be done. About a week ago, I saw several news headlines stating that the flu vaccine this year is only 10% effective. While that makes a great news headline, there is some fine print that comes along with that statement. The CDC reports that the 10% vaccine effectiveness estimate actually came out of studies from Australia’s flu season this year (they are just ending their flu season, and by all reports, it was one of the worst flu seasons they have had in that country in some time). As more testing is being done on the flu strains we are seeing here in the US, the CDC feels that the Northern Hemisphere flu vaccine will likely provide closer to 30% vaccine effectiveness against the H3N2 strain. However, we will not know how effective the flu vaccine really is until much later in the flu season after more testing can be done. 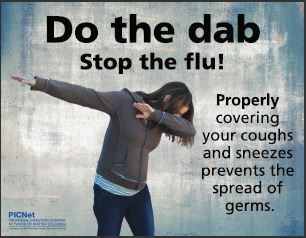 Now, if you or your children are expericing symptoms of the flu such as high fever (which is the hallmark of the flu), cough and congestion (more than just a little cold), body aches or chills, get in to see your doctor ASAP. Testing can be done with a simple swab of the nose to see if you in fact have the flu virus. If the flu is diagnosed within 48 hours of the onset of sypmptoms, your doctor might prescribe Tamiflu. Tamiflu does not CURE the flu. Ok, so what is the deal with Tamiflu? It is not a cure for the flu! Let me say again…Tamiflu does not CURE the flu. Tamiflu can stop the progression of the flu virus meaning it can shorten the duration of the flu illness by about 2 days. Tamiflu is most often prescribed for those at higher risk of serious complications from the flu which includes children under the age of 2, those with underlying asthma or lung conditions, those children whose immune system doesn’t work correctly, or any child who is hospitalized because of the flu. The biggest side effect of Tamiflu can be significant stomach upset including vomiting. I always tell parents that if we are going to try Tamiflu, if their child starts with vomiting or stomach issues as soon as the Tamiflu is started, then they should stop the Tamiflu. It is not worth causing other issues just to lessen the length of an illness by a day or so. A quick sobering reminder about the flu…thus far this flu season, there have been 12 pediatric deaths from the flu. Parents should realize that each and every year there are otherwise completely healthy children without any underlying medical issues that die because of influenza. It is still not too late to get a flu vaccine for this year. As I discussed before, we will not know exactly how effective the vaccine will be for this season for another few months. However, any protection from the flu is better than no protection. Also, when I see kiddos that have gotten their flu vaccine and then do get the flu, they are often significantly less sick and sick for a shorter time compared to their unvaccinated counterparts. So as we settle in for a LONG winter season in which we don’t expect flu activity to reach its peak for another 1-2 months, be on the lookout for any of those flu symptoms in your child. Also, a quick PSA for not taking sick children to daycare or sending them to school as that is how flu outbreaks begin. Finally, have a quick review with your kiddos about covering their coughs and washing those hands especially before eating. Stay healthy my friends!